An 18-year-old man led police on a chase through a northwest valley neighborhood before climbing onto a home’s roof, throwing tiles at officers, prompting a barricade and breaking into the home, Las Vegas police said in an arrest report. The Metropolitan Police Department report said officers first encountered Raynard Brown just before midnight Dec. 28 while responding to a domestic disturbance call, near Durango and Westcliff drives, where he reportedly continued to knock on a door on the 100 block of Logansberry Lane and refused to leave. From there, he ran and temporarily escaped officers, beginning the search and eventual barricade. Prosecutors charged Brown last week with multiple felony charges, including burglary with a weapon, property destruction and assault on a protected person with a deadly weapon. Court records show Brown was placed on house arrest. Officers eventually found Brown the night of the incident while investigating a burglary call nearby, on the 100 block of Jon Belger Drive. Metro said he entered through an unlocked sliding door and took a large knife. An officer spotted Brown holding a knife near a power box on Roland Wiley Road. The arrest report said he jumped into the backyard of a house on the 200 block of Roland Wiley, where he eventually climbed onto the roof. From there, police wrote, he ripped off roof tiles and threw them at officers and their cars. Three patrol cars were damaged, including destroyed windshields, the arrest report said. 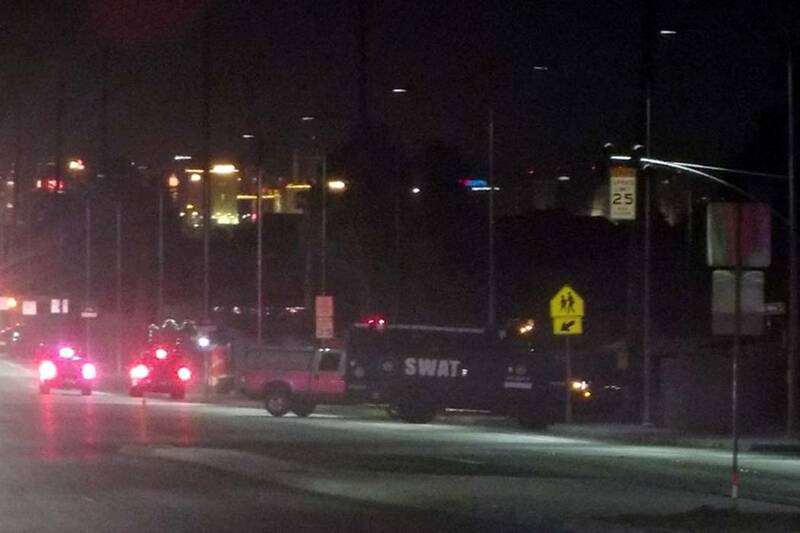 Metro considered the situation to be a barricade and called its SWAT team. SWAT used flashbangs, and Brown broke into an attic vent. From there, the report said, Brown broke through a hole through the ceiling drywall and dropped into the garage. Brown entered through an unlocked door to the kitchen, where the armed homeowner confronted him in the kitchen. The arrest report said Brown smashed through the door back into the garage. The homeowner told police he ordered Brown to drop the weapon, and Brown asked for the homeowner to shoot him. “(The man) stated Brown raised whatever he had in his hand, hover his head in a downward stabbing position, threatening (him),” the report said. At that point, according to the report, the homeowner used the garage door opener to raise the door, allowing SWAT to rush in and take Brown into custody. Police took him into custody about 3:15 a.m., Metro Lt. David Gordon said at the time. A Metro officer was injured while chasing the man before he climbed onto the roof. The man was taken to a hospital for evaluation after he was arrested, Gordon said. After the barricade, shattered roof tiles lay scattered across the street in front of the home. Neighbors ventured outside and used the light from their cellphones to check for damage on cars parked along the street.